Clark's Corvair Parts, Inc. catalog lists parts and kits for many different performance applications other than just the stock engine configuration. Corvair motors are now being used in aiplanes and air boats with great success and reliability. The Corvair motor makes an economical solution to your power needs. MID ENGINE V8 IN CORVAIRS! THE STOCK CORVAIR ENGINE: All Corvair engines are "flat" air cooled 6 cylinder engines that rotate in a direction that is opposite of VW applications from that time. We sell reverse rotation engine kits. The block, housings, heads & pistons are aluminum, the cylinders are cast iron.The engines came from the factory with 2 carbs, 4 carbs or a single carb with a turbo. Please remember that the horsepower ratings from the '60s were not calculated the same as today. PERFORMANCE ENGINES - during the '60s Yenko offered race Corvair engines with indicated horsepower as high as 240hp. Today you can easily build a durable street or offroad engine with 140-200+hp. 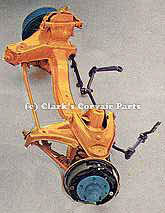 Clark's Corvair Parts, Inc. catalog lists 100's of performance parts. SUSPENSION: The front suspension of a Corvair is 'self contained' and is only held in by 6 bolts-for this reason Corvair suspensions were used quite a lot for Hot Rods during the '60s & '70s (but not quite as often now). Our catalog lists any parts that you may need & can help you determine what year suspension and steering box you have.